L. Ron Hubbard is contracted by Hermitage House Publishing to write Dianetics. In the first week of March he completes Dianetics: The Modern Science of Mental Health. L. Ron Hubbard writes Dianetics: The Evolution of a Science for magazine publication to promote and accompany the release of Dianetics. On 9 May 1950, Dianetics is released and appears on the New York Times best seller list, 18 June 1950. It remains on the best seller list for twenty-eight consecutive weeks and launches a national movement which will soon become the fastest growing such movement in America. 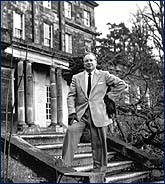 On 7 June L. Ron Hubbard delivers his first recorded lectures on Dianetics in Elizabeth, New Jersey, where the Hubbard Dianetics Research Foundation is formed. On 10 August, after moving to a new residence in Los Angeles, California, L. Ron Hubbard delivers a lecture on Dianetics to a sell-out crowd of over 6,000 people at the Shrine Auditorium. Through the remainder of the year, L. Ron Hubbard continues to tour and speak in major cities and by the end of December he has delivered over one hundred lectures and crisscrossed the country. L. Ron Hubbard writes six books which outline his discoveries in the field of the human mind and give practical technology to better human existence. In addition to the printed word, he delivers more than 100 lectures on the subject of Dianetics. After returning from Havana, Cuba, where he completes the book Science of Survival, he opens the first Hubbard College in Wichita, Kansas, delivering lectures and conducting courses. In the fall of 1951, having discovered that man is most fundamentally a spiritual being, he begins a new line of research to determine what can be done to help an individual regain natural abilities. These discoveries form the basis of Scientology. L. Ron Hubbard moves to Phoenix, Arizona where he opens his office and establishes the Hubbard Association of Scientologists International. In September, traveling to England, he establishes the Hubbard Association of Scientologists International in London. In late November L. Ron Hubbard returns to the United States, where in Philadelphia he delivers a Doctorate Course in Scientology with 62 lectures in 18 days providing a wide analysis of human behavior. The lectures are known as the Philadelphia Doctorate Course Lectures. He then travels back to England where he begins plans for a research trip across Europe. In addition to delivering 190 lectures on subjects such as emotional tones, communication and creativity, L. Ron Hubbard writes of his further research on mans spiritual potential in four new books. Motoring across Europe to Barcelona, he follows World War II invasion routes to study the effects of devastation on populations; he also researches European university systems. L. Ron Hubbard returns to Phoenix, where he releases new breakthroughs which enable the individual to explore his past and improve his reactions toward life. During this period, Mr. Hubbard also researches the basics of organization, developing principles that any group can use to survive and prosper. He delivers 232 lectures and writes two more books. In recognition of the spiritual nature of L. Ron Hubbards philosophy, a number of Scientologists in Los Angeles, California form the first Church of Scientology in February. L. Ron Hubbard further researches and develops the religious philosophy of Scientology in Phoenix, delivering more than 460 lectures and continuing to write extensively. In March, L. Ron Hubbard moves from Phoenix to Washington, DC, where the Founding Church of Washington, DC is formed with Mr. Hubbard as Executive Director. He drafts organizational policies and intensifies his work in developing an administrative technology to allow Scientology churches to run smoothly and expand. During October L. Ron Hubbard returns to England to deliver lectures in London, while further establishing the London organization. Mr. Hubbard delivers over 200 lectures in this year, on subjects from counseling techniques to education and alcoholism. In December he travels to Ireland to initiate the formation of an Irish organization in Dublin and then returns to England. Returning to Dublin, L. Ron Hubbard researches and develops the exact steps and actions a person follows to establish a successful Scientology mission anywhere in the world. He also writes a book containing simple but powerful precepts that allow anyone to immediately improve their life. In Barcelona, Spain he conducts additional research, then returns to Washington, DC where he delivers a series of lectures which cover spiritual and material requirements of man. He then sails back to England aboard the Queen Elizabeth, during which time he writes a book providing solutions to day-to-day job stress. After delivering 12 lectures on human problems in London, he again returns to Washington, DC. While delivering more than 130 lectures, detailing solutions to such problems as environmental radiation and the failings of groups, L. Ron Hubbard also runs both the Washington and London organizations during this year and finds the time to write two more books. In February Mr. Hubbard travels to Puerto Rico where he continues researching and writing. In April he flies to London to deliver a series of lectures on auditing techniques and then travels to Washington. While still concentrating on further organizational and administrative developments and delivering over 145 public lectures, L. Ron Hubbard also writes two books to better speed an individuals spiritual progress. 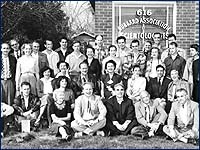 L. Ron Hubbard delivers 133 lectures in 1958, including the Clearing Congress Lectures in Washington, DC, the first six of which are filmed. In October L. Ron Hubbard sails to London aboard the RMS Statedam. In England, he delivers 45 lectures, while reorganizing local offices. With this accomplished, he sets sail back to Washington in early December aboard the Saxonia. L. Ron Hubbard defines the duties in various Scientology churches and delivers 16 lectures on auditing refinements in Washington, DC. In March he begins negotiations to purchase Saint Hill Manor in Sussex, England which will be his home for the following seven years. By May, negotiations are completed and L. Ron Hubbard moves his residence to the 55-acre estate. The worldwide headquarters of Scientology is moved to Saint Hill. In yet another line of research, this one involving different orders of life, L. Ron Hubbard conducts horticultural experiments in greenhouses at Saint Hill which bring about major increases in plant growth. His discoveries are written up in horticultural magazines internationally and receive wide coverage in daily newspapers. The first E-Meter designed and built to Mr. Hubbards exact specifications is produced. On 16 October L. Ron Hubbard begins an around-the-world trip, traveling to Greece, India, Melbourne, Hawaii, San Francisco and New York, arriving back at Saint Hill the first week of December. In Melbourne alone, he delivers 38 lectures, and while in the United States he writes and issues an organizing board for American Scientology churches (a board which shows what functions are done, the order they are done in, and who is responsible for getting them done). Upon his return to England, L. Ron Hubbard appears on BBC television discussing his horticultural experiments. Shortly afterwards he travels to Washington, DC. In all he gives 102 lectures this year and writes one book.